Walter Lippmann (September 23, 1889 - December 14, 1974) was an influential American writer, journalist, and political commentator. Like many intellectuals during his era, he began his career as a socialist while in school, but would quickly renounce these views in favor of a life-long, if sometimes cynical, commitment to the liberal, democratic idea. Lippmann struggled with his belief in democracy, expressing concern that the public was not up to the demands on an educated electorate required by a successful democracy. Lippmann was an early proponent of the role of "experts" to carry out the functions of government, but later came to question their effectiveness as well. 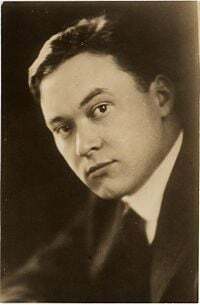 Walter Lippmann was born on September 23, 1889 in New York City to German-Jewish parents, Jacob and Daisy Baum Lippmann. The family lived a comfortable, if not privileged, life. Annual family trips to Europe were the rule. At age 17, he entered Harvard University where he studied under George Santayana, William James, and Graham Wallas. He concentrated on philosophy and languages (he spoke both German and French) and graduated after only three years of study. While at Harvard, Lippmann became a socialist, helping to found the Harvard Socialist Club. However, his belief in socialism was not long-lasting. Following his graduation from Harvard, Lippmann had a long and influential career as a journalist, a media critic, and a philosopher. He was an informal adviser to several presidents. In his work, such as his 1920 book Liberty and the News, Lippmann tried to reconcile the tensions between liberty and democracy in a complex and modern world. He received the Presidential Medal of Freedom, presented to him by President Lyndon Johnson on September 14, 1964. Walter Lippmann died on December 14, 1974, at age 85 in New York City. Lippmann was hired by muckraking journalist, Lincoln Steffens, as a secretary, launching his career as a journalist, media critic, and political philosopher who argued that true democracy is a goal that could not be reached in a complex, industrial world. After publishing A Preface to Politics in 1912, Lippmann, together with Herbert Croly and Walter Weyl, became the founding editors of The New Republic magazine a year later. During World War I, Lippmann became an adviser to President Woodrow Wilson and assisted in the drafting of Wilson's Fourteen Points. He would later serve as a U.S. delegate to the Paris Peace Conference, helping to draft the charter of the League of Nations. Lippmann saw the purpose of journalism as "intelligence work." Within this role, journalists are a link between policymakers and the public. A journalist seeks facts from policymakers which they then transmit to citizens who form public opinion. In his model, the information may be used to hold policymakers accountable to citizens. His theory was spawned during the industrial era and some critics have argued that the model needs rethinking in post-industrial societies. Though a journalist himself, he held no assumption that the news and truth are synonymous. For him the "function of news is to signalize an event, the function of truth is to bring to light the hidden facts, to set them in relation with each other, and make a picture of reality on which men can act." A journalist’s version of the truth is subjective and limited to how he constructs his reality. The news, therefore, is "imperfectly recorded" and too fragile to bear the charge as "an organ of direct democracy." It was Lippmann who first identified the tendency of journalists to generalize about other people based on fixed ideas. He argued that people—including journalists—are more apt to believe "the pictures in their heads" than come to judgment by critical thinking. Human beings condense ideas into symbols, he wrote, and journalism is an ineffective method of educating the public. Even if journalists did better jobs of informing the public about important issues, Lippmann believed "the mass of the reading public is not interested in learning and assimilating the results of accurate investigation." Citizens, he wrote, were too self-centered to care about public policy except as pertaining to pressing local issues. Early on, Lippmann was optimistic about American democracy. He embraced the Jeffersonian ideal, believing that the American people would become intellectually engaged in political and world issues and fulfill their democratic role as an educated electorate. In light of industrialization, the events leading to World War II and the concomitant scourge of totalitarianism, he came to reject this view. In his later view, democratic ideals had deteriorated, voters were largely ignorant about issues and policies, lacking the competence to participate in public life and caring little for participating in the political process. In Public Opinion (1922), Lippmann noted that the stability the government achieved during the patronage era of the 1800s was threatened by modern realities. He wrote that a “governing class” must rise to face the new challenges. He saw the public as Plato did, a great beast or a bewildered herd–floundering in the "chaos of local opinions." The basic problem of democracy, he wrote, was the accuracy of news and protection of sources. He argued that distorted information was inherent in the human mind. People make up their minds before they define the facts, while the ideal would be to gather and analyze the facts before reaching conclusions. Lippmann argued that looking at the world through stereotypes (a metaphor he coined) subjected us to partial truths. He likened a stereotype to a "picture in our heads" saying "Whether right or wrong, … imagination is shaped by the pictures seen… Consequently, they lead to stereotypes that are hard to shake" (Ewen and Ewen, 2006). Lippmann called the notion of a public competent to direct public affairs a "false ideal." He compared the political savvy of an average man to a theater-goer walking into a play in the middle of the third act and leaving before the last curtain. Early on, Lippmann said the "herd" of citizens must be governed by "a specialized class whose interests reach beyond the locality." This class is composed of experts, specialists, and bureaucrats. The experts, who often are referred to as "elites," were to be a machinery of knowledge that circumvents the primary defect of democracy, the impossible ideal of the "omnicompetent citizen." Later, in The Phantom Public (1925), he recognized that the class of experts were also, in most respects, outsiders to particular problems, and hence, not capable of effective action. Some modern critics of journalism and democracy say that history has borne out Lippmann's model. The power of the governing elites stretches from the early days of the twentieth century to the New Deal of the 1930s and remain with us today. Walter Lippmann and Charles Merz, in a 1920 study entitled A Test of the News, stated that The New York Times' coverage of the Bolshevik revolution was biased and inaccurate. Following the removal from office of Henry A. Wallace in September, 1946, Lippmann became the leading public advocate of the need to respect a Soviet sphere of influence in Eastern Europe, in opposition to the containment strategy advocated at the time by George F. Kennan and adopted by President Harry Truman and subsequent U.S. presidents. Lippmann was the first to bring the phrase "Cold war" to common currency in his 1947 book by the same name. But despite his contrarian views, Lippmann had no particular sympathy for communism. However, the Golos spy ring used Mary Price, his secretary, to garner information on items Lippmann chose not to write about or names of Lippmann's sources, often not carried in stories, but of use to the Soviet Ministry for State Security. In addition to his Pulitzer Prize-winning column "Today and Tomorrow," Walter Lippmann published several books. He had wide access to the nation's decision makers and was widely influential in the creation of modern journalistic practices. He examined the coverage of newspapers and saw many inaccuracies and other problems, an example of early media criticism. The Walter Lippmann House at Harvard University, which houses the Nieman Foundation for Journalism, is named after him. Lippmann came to be seen as Noam Chomsky's moral and intellectual antithesis. Chomsky used one of Lippmann's catch phrases for the title of his book about the media: Manufacturing Consent. Philosopher John Dewey (1859-1952) agreed with Lippmann's assertions that the modern world was becoming too complex for every citizen to grasp all its aspects, but Dewey, unlike Lippmann, believed that the public (a composite of many “publics” within society) could form a “Great Community” that could become educated about issues, arrive at judgments, and reach solutions to societal problems. McPherson, Harry C., Jr. Walter Lippmann and the American Century Review Essay, Foreign Affairs (Fall, 1980). Retrieved March 4, 2011. All links retrieved August 8, 2014. This page was last modified on 8 August 2014, at 16:56.